To those who have contacted me through this blog concerning the events of the past few days, thank you all for your interest, notes, comments and remembrances. The Official Red Barn Theatre Blog went up late last night at http://redbarntheatre.wordpress.com/. In the coming days photos, video, audio interviews and stories will be added. As well the Official Red Barn Theatre Blog will be the nerve centre for ongoing updates and any further news concerning plans for a rebuilding collection fund, rebuilding and plans for the 60th Diamond Jubilee season of the Red Barn Theatre for summer 2009. The rest of the Sibbald family and I as well, I’m sure, as other local Red Barn supporters and volunteers would greatly appreciate if you could also send/re-send and post or re-post your comments and stories to the Official Blog. In particular, we are looking for your personal stories and remembrances, the livelier, the better. Please note that your voices are extremely important to hear: the more support we can get, the easier it may make it to access public and private funding in the future to enable the possibility that the old girl may rise from the ashes. 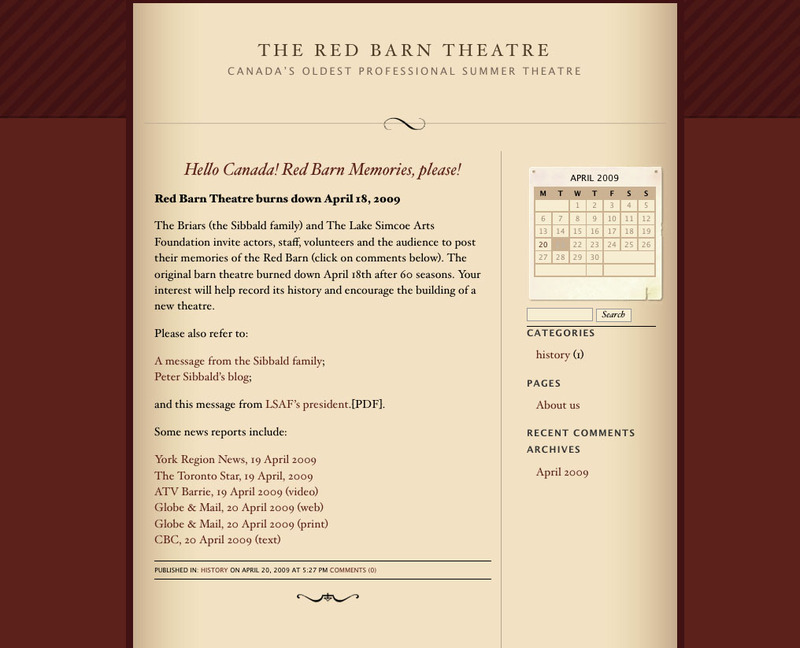 Please add your comment to the Barn’s official blog: http://redbarntheatre.wordpress.com/.